I always love hearing about different families' Thanksgiving traditions. My family is small and scattered around the country, so it's usually just my brother, parents and me at their home in Connecticut. I'm tempted to say that the holiday is low-key for us, because the day starts out with a road race, sweat pants and football watching time and involves lots of time for reading, napping, and lounging, before we gather around the dining room table and feast. I realize, though that most people wouldn't consider a full day of cooking, including two desserts for only four people to be "low-key." We're dessert people, and I'm in charge of picking and making the desserts we'll have each year. This year, my mom requested a red velvet cake after seeing the recipe in November's Veranda magazine, and I decided that even though I have a family of pumpkin pie-haters, I had to do something Fall-ish for the occasion, and...well, who doesn't like cheesecake? I made this pumpkin cheesecake with ginger-graham crust from the Joy of Baking. When I bake dessert for myself alone, I'm kind of haphazard, I rush through any measurements involving the word "spoon" and I make round desserts in square pans. Since my parents have an amazing kitchen with all the proper-shaped pans, I tried to hold myself to higher standards and produce something that would look as good as it tasted. Both desserts definitely looked homemade (HOW do bakeries get frosting to so thoroughly cover the sides of layer cakes? HOW, I ask?!) and I was a little disappointed with how short the pumpkin cheesecake was, but both tasted good enough for me to go way beyond comfortably full and try finish a slice of each. The red velvet cake recipe caught me off guard, because it uses vegetable oil rather than butter as fat--TWO CUPS of olive oil went into it (and 1/4 cup of red food coloring comes out to two entire bottles!) and the batter looked really thin going into the pans. It baked out dense and moist, though, and I'll be happy to use vast quantities of vegetable oil in any and all desserts I make in the future. My motto is “I want to inspire you with food for thought and food for your table”. I get much of my inspiration from local producers, markets and restaurants. I tend to stroll through farmers markets and let what looks good and what’s in season inspire me. 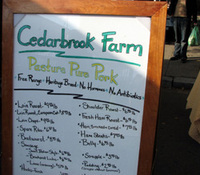 Last week, Cedar Farm scrapple caught my eye and brought great memories of my childhood; eating a big Sunday breakfast before we all headed off to church. Other times it’s reading what other people are making on sites like Don Rockwell and Chowhound. 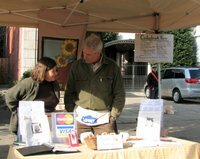 On Saturday I went to the Del Ray farmers Market in Alexandria, knowing that shortly they will the shutting down for the winter. It’s a market that has grown on me as I’ve gotten to know some of the vendors. There’s the wonderful gentleman who’s farm is in Riva, VA and Tom the cheese guy from whom I’ve enjoyed wonderful herbed chevres. 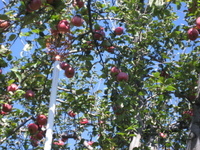 Other faces are more familiar such as Toigo Orchards. Well, just like last year, most of the vendors cleared out early leaving only the hearty to proffer their goods during the last Saturdays of the season. With only a pear, a half gallon of apple cider and a log of chevre; where was inspiration to come from today? All I needed to do was turn around and walk about 100 feet to the doors of Cheesetique. I wanted to get a small piece of gorgonzola since I’ve heard so much about how the cheese pairs well with pears. As I walked into Cheesetique, with the mélange of cheese smells wafting up my nose, I knew I was in good hands. “I just bought a nice pear from Toigo Orchards and was thinking of pairing it up with a gorgonzola, perhaps a gorgonzola dolce”, I said. “Hmmm”, I don’t thing we have dolce. Are you sure you want gorgonzola? 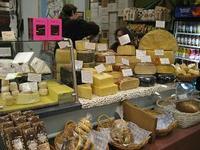 We have lots of blue cheeses which would work very well”, a helpful woman said. “Sure anything moldy will do”, I replied. She laughed and had a look of “this one will try anything…..just my kind of customer”. And I was. I sampled 2 cheeses before I put into my mouth this blue cheese called ba ba blue. From the Carr Valley of Wisconsin, it is sheep’s milk blue which is piquant, salty and subtle with blue veins. It pops in the mouth, bringing an immense bang for the buck. I loved it. I bought it. I paired both the pear and ba ba blue cheese in a risotto which will knock your socks off. I served this with a roasted chicken and asparagus. Enjoy! Place chicken broth in a stock pot and heat to a gently simmer. 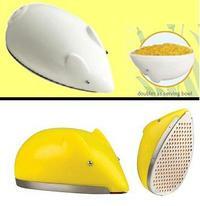 Keep warm throughout cooking process. Heat olive oil in a pan. Add shallots and cook until translucent, but do not brown. Add rice and cook for 5 minutes, stirring frequently. Add white wine and stir until absorbed. Add warm chicken broth ¼ cup at a time to the risotto. Stir frequently. When broth is absorbed, add additional stock. The risotto will continue to absorb stock and cook over a period of 15-20 minutes. When the risotto is al dente, add crumbled blue cheese and stir to incorporate. Add salt and pepper to taste. About half way through the risotto cooking process, heat 2 tbsp. of butter in a heavy bottom pan. Add pears and cook on each side until caramelized, about 3 minutes on each side. 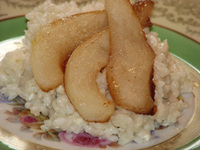 To serve, plate risotto and top with 2-3 slices of caramelized pear. One of my favorite things about Cheesetique is the level of personal attention they give to every customer. They are generous with their samples, and they take the time to find out what you like so they can offer recommendations...and those are usually spot-on. On my most recent visit, I asked them to point me toward something fresh and local. Without hesitation, they recommended I check out Monocacy Ash. A fresh goat's milk cheese from Cherry Glen Farm in Montgomery County, Monocacy Ash comes encased in a rind of vegetable ash and features a thin line of ash running horizontally throughout. It is an artisanal cheese, produced in small batches by Diane Kirsch (the last name is German for "Cherry") and her herd of American Alpine and Toggenburg goats. 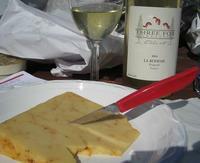 This is a super-creamy cheese with a far milder tang than most goat's milk cheeses. The manager on duty at Cheesetique described it as similar to Cypress Grove's Humboldt Fog, but I found it to the taste to be smoother and softer despite the similar mouth feel from the ash ribbon. And the price of $17.95 for a full round ($8.98 for a half) was a few dollars cheaper than the price at which I've found Humboldt Fog in retail shops, making it easier on the wallet, as well. Perhaps the most distinct feature of Monocacy Ash, however, was the speed with which it softened. Even on the short drive home, the half-crottin that we purchased had begun to liquefy along its rind. Refrigeration firmed it up a bit, but as soon as we set the cheese on the counter to warm to room temperature it literally began to ooze along the edges. By the time we had brought the cheese plate to the table, the soft disc of cheese had separated itself from the ashy rind and was migrating toward the center of the plate. This is not a cheese that lends itself to lengthy savoring - its soft, creamy texture begs to be dug into immediately, and it spreads beautifully on baguettes, crackers, or pretty much anything. It was interesting to see that the rind held its shape despite the loss of its interior goodness. And I'm not ashamed to admit that I may have scooped at the walls with a cracker or two to get at some of the tangy-sweet, gooey remnants that the main disc left behind when it oozed out. My experience with Monocacy Ash was decidedly positive, if a bit messy. I am looking forward to trying the other offerings from Cherry Glen - Monocacy Gold and Monocacy Silver. The small batches in which they are produced tends to limit availability, but I have found Monocacy cheeses for sale at Cheesetique as well as some local Whole Foods (try their Georgetown location, but availability can be a bit hit or miss). If you like your goat's milk cheese on the milder side with the added flavor that the vegetable ash contributes, you should definitely give this one a try. Tom Colicchio's "Think Like a Chef"
Calling "Think Like a Chef" a cookbook is like calling a Sherlock Holmes novel a detective story. Tom Colicchio's book goes beyond the basic formula to offer something new, something interesting. "How a chef thinks about food" is the phrase Colicchio uses in his preface to describe what follows, and "Think Like a Chef" certainly delivers. In 2000, when the book was first released, Tom Colicchio was the successful chef of Gramercy Tavern who had attracted a loyal following among the Foodies of New York, but he was nowhere near the celebrity he is now. Craft had not yet opened (that would occur in March of the following year), and Top Chef was still six years away. 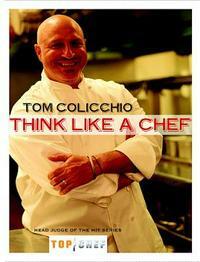 Seven years later, "Think Like a Chef" has been re-released, taking full advantage of Colicchio's star power. The cover art now features him smiling broadly, and it identifies him as "Head Judge of the Hit Series 'Top Chef.'" But this is no vanity project - you won't find Colicchio name-dropping his way through a list of Gramercy Tavern favorites. The book still features the unique approach to cooking that sets it apart from simple recipe collections. It progresses, organically, from a few basic techniques to a few key ingredients and then on to recipes involving some of Colicchio's favorite ingredients and "trilogies" (three ingredients whose flavors simply work together, according to the chef). Before it gets started, it even offers advice on "how to use the book," encouraging the audience to read all the way through the book to best grasp what is being discussed and to follow the progression that Colicchio has laid out to truly absorb the process. 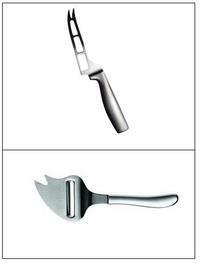 "Think Like a Chef" begins, like a good chef should, with technique. The first section of the book walks the reader through five basic techniques: roasting, braising, blanching, stock-making and sauce-making. With these five skills in your culinary arsenal, so many seemingly complicated dishes become significantly easier. Colicchio is a great teacher - he guides you step by step without giving the impression that he is dumbing things down for you. Along the way, he provides anecdotes and asides that further humanize the text and give insight into the chef's approach to cooking. Once each technique has been explained and demonstrated with a simple recipe, it is followed by several more complex recipes, each of which uses the technique. Striped bass, sirloin, and leg of lamb are all roasted with a variety of herbs and seasonings, and the small adjustments that turn a general technique into a specific set of steps for a recipe are highlighted. From here, Colicchio moves on to "studies" of three basic ingredients - roasted tomatoes, pan-roasted mushrooms and braised artichokes. As in the previous section, he takes the time to walk you through the basic recipe before elaborating on it and using it as the inspiration for a dizzying variety of recipes. This, says Colicchio, is the key to thinking like a chef - allowing yourself to be led by the ingredients you find at your disposal in different directions using the techniques at your command. Just reading through this section, you feel yourself starting to understand what he means...at one point, I realized that I was reading a recipe and mentally adjusting it to better suit my own tastes and a few other ingredients I had picked up at the farmers' market that weekend. The remaining sections of the book move from the theoretical to the practical - a series of recipes for each of three seasonal trilogies shows the surprising ways the same ingredients can be combined to create diverse flavor profiles, and a section of favorites provides a (very) few of Colicchio's favorite dishes from his own kitchen. As instructed by the chef, I read through the book from beginning to end before I even thought about attempting any of the recipes inside. I was pleasantly surprised by the narrative voice and the flow of the book - I didn't feel like I was reading a reference book or some kind of flat, lifeless text. I really did feel like I was gaining insight into Tom Colicchio's mind and his approach to his craft. After reading the book, I was that much more eager to put the chef's lessons into practice. A visit to the farmers' market turned up a beautiful selection of wild mushrooms, and I decided then and there that my first attempt at a recipe from the book would be the pan-roasted mushrooms that form the basis of the second "study." 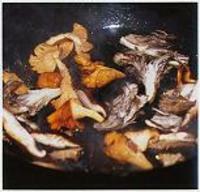 I had already learned from reading through the section that the single most important thing to keep in mind when roasting vegetables and mushrooms is not to crowd the pan - doing so prevents the moisture that cooks out from rapidly evaporating and basically boils your veggies until they are lifeless and rubbery. So I cooked the mushrooms in three batches (resisting my usual urge to just throw them all in at once) and seasoned them with salt and pepper. When I turned them, I noted with some satisfaction the way the mushrooms had begun to brown without losing their shape or their texture. Adding some garlic, butter and herbs I brought each batch to readiness and set it aside until all of the mushrooms were cooked. At the end I brought all three batches back together and seasoned them once more as I warmed them just prior to serving. Though I overdid the salt a bit, my wife and I agreed that these were by far the best mushrooms I had ever made, and they were a perfect accompaniment to our oven-roasted pork tenderloin. I found the directions easy to follow, and the results spoke for themselves. This was a recipe worth holding onto - as I expect many of the ideas from the book will be. "Think Like a Chef" invites the reader to develop a new way of looking at what goes into a kitchen - as well as what comes out. Tom Colicchio has provided an excellent resource for Foodies who are long on appreciation but short on raw talent. I'm already looking forward to next year's farmers' markets and the creative eye with which I will approach them thanks to this book. When she learned of my ongoing effort to highlight off-the-beaten-path cheese purveyors in and around Washington, one of my wife's coworkers insisted I check out Arrowine in Arlington. A neighborhood wine shop in the truest sense of the term, Arrowine is located in the Lee Heights shopping plaza where Lee Highway and Old Dominion Road intersect. It is one of a strip of small, independently owned shops that seems completely incongruous with their quintessential suburban surroundings. Look for the row of large, colorful awnings and you'll know you've found the place. Arrowine is a gourmet's dream - though primarily a wine store, they carry a wide range of gourmet foods, fresh-baked breads and bagels, and a terrific selection of charcuterie and meats from D'Artagnan and other top names. 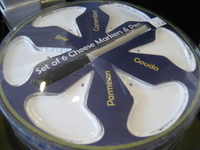 Of particular interest to me, however, is their cheese counter. 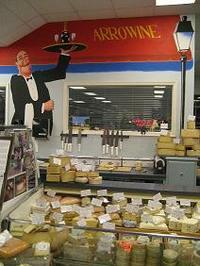 Covering half of the store's rear wall, Arrowine's cheese counter is stocked with classics and rarities alike. Head straight back from the entrance, toward the towering painting of the waiter, and you will soon be greeted by large wheels and wedges of cheese. Their selection spans the globe, and it is sourced with an eye toward what is freshest and what is best. Consequently, there are only a few local cheeses available right now - with Meadow Creek Farms' impressive and flavorful Grayson the best of the bunch. 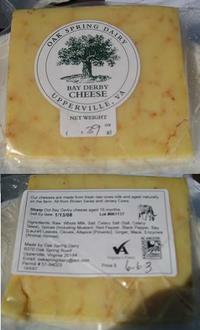 Very few of their cheeses are sold in pre-weighed quantities - most are sliced fresh when you order. As a result, your selections rarely have time to acquire that plastic wrap residue that can ruin the flavor of milder cheeses. The sight of so many great cheeses should be a hint that you're in a place where they take cheese pretty seriously, but as soon as you start talking to one of the employees behind the counter, you'll know it. Every employee I spoke to in my three recent visits has been working at Arrowine for at least a year, and on my first visit I had the good fortune to meet Aldo Molina. As soon as I expressed interest in the cheeses, Aldo completely forgot about the fact that it was a mere half hour before closing. He started talking to me with an eagerness that reflects his love for what he does, showing me cheeses that I had never heard of and encouraging me to sample. Aldo learned cheese from Steven Jenkins at Dean & DeLuca in New York, and if that name sounds familiar it's because he is the author of Cheese Primer, an encyclopedic look at cheese that is a must-read for all cheese lovers. On my subsequent visits, however, I was not as lucky. On both occasions, I found myself struggling to strike up a conversation with the employee behind the counter, and I had to request to taste cheeses despite my obvious interest in learning more about them. This struck me as a bit counter-intuitive in a place that prides itself on its wide selection of unfamiliar cheeses and its knowledgeable staff. Despite this inconvenience, I was definitely impressed with the variety of cheeses and other products on offer at Arrowine, and I found myself eager to return to see what new goodies I could find. If you're in Arlington and planning a wine and cheese party, look no further; their staff can walk you through pairings and price points for both. But be prepared to ask for what you want. And if Aldo's behind the counter, ask him what he would recommend - you're in for a treat.